I keep on thinking of these tombs as temples – to the Afterworld. 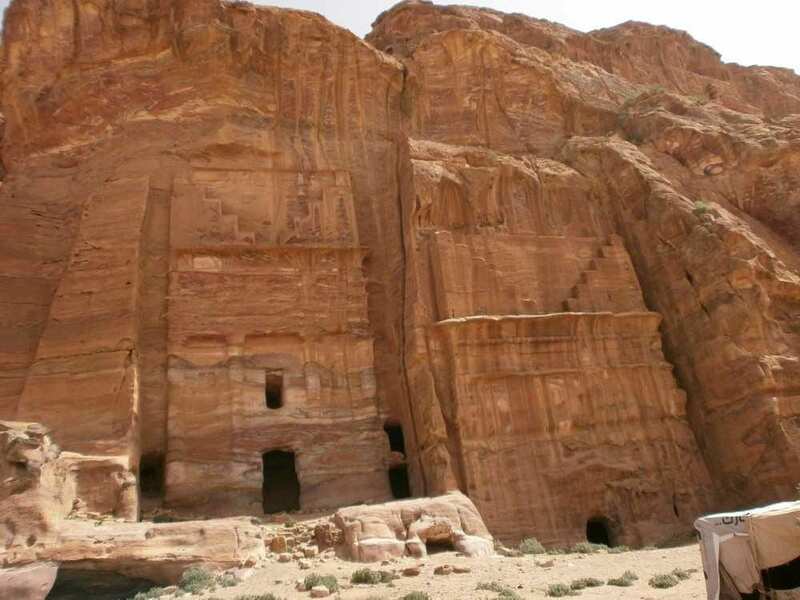 Innumerable, all carved into the soft sandstone striated with different hues, or sandy as one expects with sandstone, or the rose-red stone Petra is famous for. The variety never ended. Variety in the colour of stone, in the tombs like great temples, and the humbler ones pock-marking the endless sheer cliffs. From the so-called Treasury we walked through a wider gorge to an open space filled more with camels and donkeys than people. On one side was a huge raked theatre. Was this the main square then, of the – cemetery? I was right and wrong, which is so often the case with Petra. This is not a city for the living. 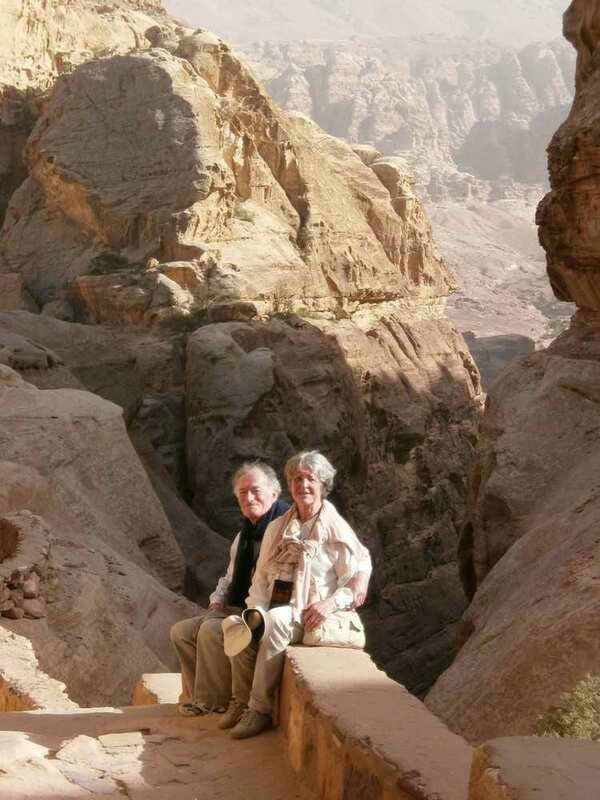 The Nabateans lived on a hill not far from our hotel where the modern town is today. The theatre was not used for entertainment, but for the visiting merchants who came to discuss their business with their hosts under the watchful eyes of the Nabatean ancestors, Ibrahim our guide assured us. Once finalised, then the practicalities were carried out in Little Petra. Many of these noble temple-tombs followed a basic pattern of four columns supporting a pediment with the urn on top and a recess for the burial. It was left uncovered for some days so the soul of the deceased could climb up the steps to the right – to heaven – or to the other place on the left. (I always get muddled if it’s left and right for the onlooker or the soul. It’s the soul who decides.) So most tombs have the four steps cut on either side of the tomb. From the gathering place in front of the theatre the valley opened out. We walked along the street of façades and climbed to the Royal Tombs that overlooked the valley towards the setting sun. Then along a ridge to the ruined monastery with fine 6th-century Christian mosaics, the last gasp of the Byzantine Empire before it fell to the sword of the Prophet’s followers, the Umayyads, who ruled a vast empire from about 650 to 770 AD. The ground was hard rock covered by loose sand and stones of all sandstone colours. Vegetation was sparse, mostly a tough green leaf which Ibrahim said was of the onion family and chewed by sheep and goats. By camels and donkeys too, I hope. They were the only animals we saw, with a very occasional dog. The optional lunch was the usual buffet, tasty with unleavened bread, but welcome after over four miles of walking. More was to come. We were offered as options, on our own, the 900 steps to the ‘monastery’ or the walk over peaks, of medium difficulty, to end up by climbing down over the top of the ‘Treasury’ and back along the gorge. That was our only way out. We took the 900 steps, pausing every 100 or so to look at the peaks rising from the sandy valley to rose-red ridges paling into blue and yet more grey peaks on the horizon. In some places the rocks tilted over a precipice; in others they were so narrow one had to hug the cliff face. (We heard later that it was far worse on the alternative ‘medium difficulty walk!) The ‘monastery’ was another superb temple-tomb cut deep into the peak. Why here? Imagine the worshippers climbing those 900 steps! On our descent I skidded on the sand covering a rock and fell on one side. I was annoyed with myself for not wearing trainers like John, all because I wanted to put my toes into stirrups! How foolish can one get?